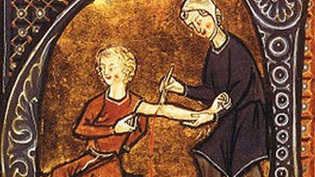 A stomach-churning potion from the Dark Ages could be the death of the modern day Methicillin-resistant Staphylococcus aureus (MRSA) infection, according to researchers who claim that the ancient treatment outperforms conventional antibiotics. Scientists have been “dumbfounded” at the killing ability of the potion – an ancient cure for eye infections dating back to the 10th Century – after a series of tests in Britain and the US during the past year. That the Anglo-Saxon recipe, which includes wine, garlic, and bile from a cow’s stomach, could hold the key to defeating MRSA came about after a chance discussion between experts at the University of Nottingham last year. During a meeting of academics interested in infectious diseases, Dr Christina Lee, an expert in Old English, told microbiologists about Bald’s Leechbook – an Anglo-Saxon medical textbook kept in the British Library which contains remedies for treating infections and other ailments. Dr Lee translated a recipe for treating styes – an infection of an eyelash usually caused by Staphylococcus aureus – and the past year has seen researchers painstakingly recreate it and test it on MRSA. The thousand-year-old remedy has proven to be an “incredibly potent” antibiotic, according to lead researcher Dr Freya Harrison, a microbiologist from the University of Nottingham.